I glance up at my computer screen and see the tweet I’ve eagerly anticipated for months. Kapnos Kouzina is officially taking reservations. 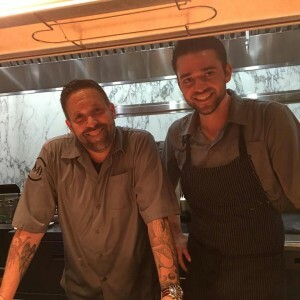 Bethesda’s newest restaurant is from the prolific Mike Isabella and his partner George Pagonis, both former “Top Chef” contestants. I race to snag a table for opening night. My “Top Chef” fanaticism is well-documented on this blog, so my enthusiasm should come as no surprise to those who follow me. This third Kapnos location follows its DC and Arlington predecessors, offering Greek-inspired shared plates. Kapnos Kouzina veers in a slightly different direction with a more casual feel, and a Greek home-style experience. On opening night Chefs Isabella and Pagonis are toiling in the kitchen. It’s a sight that should be enjoyed while it lasts. With Isabella’s dizzying array of upcoming projects, he can’t linger for long. The competent staff handles the first night crush with ease. Chef de cuisine Greg Basalla is here from the more seafood-focused Kapnos Taverna in Arlington, and our amiable server hails from there as well. 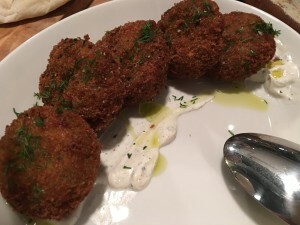 The menu at Kapnos Kouzina is organized into sections: spreads, cold mezze, garden mezze, ocean mezze, flatbread pyde, souvlaki, and for the table dishes including rack of lamb, moussaka, bronzino, and fried chicken. A visit to any Kapnos must commence with a trio of spreads; at least mine always do. It’s a chore to narrow it down to three. My favorite is taramosalata with carp roe, caviar and cauliflower. Spoon a thick layer of Tyrokaftari over house made flatbread and enjoy. This dip combines feta, smoked manouri cheese, jalapeno, and grains of paradise. 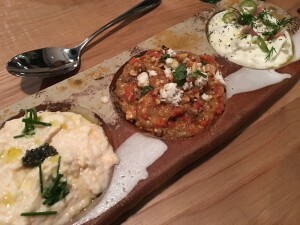 Another crowd-pleaser is chunky melitzanosalata with smoked eggplant, roasted peppers, walnuts, and feta. It’s best to pair the dips with sips. The cocktail menu is another exercise in decision-making. After a few minutes of intense consideration, I go with Chloe & Llamas- a Peruvian blend of macchu pisco, campari, cocoa nib, banana-orgeat, lime, and egg white. Zucchini fritters with pepper yogurt are both fulfilling and filling. We rely heavily on ocean mezze to round out our meal. Charred octopus with beluga lentils doesn’t float my boat, but my friend declares it her favorite dish. 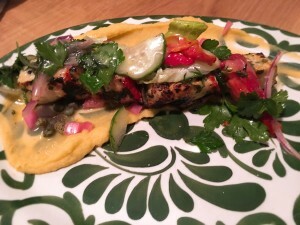 Fish kebabs are where pescatarian/kosher diners can focus. Swordfish kebab with fava, roasted tomato, caper and dill has the edge over salmon with cauliflower puree and shaved brussels sprouts. 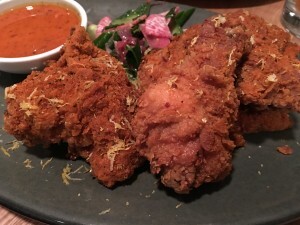 Fried chicken is causing a frenzy lately, and I’m right there with the rest of the fanatics raving about renditions at Convivial, Maketto, and Barrel and Crow. Add Kapnos Kouzina fried chicken into the mix. It’s simple but oh so good with a crispy coating, juicy interior, and a dipping sauce of harrissa and honey that you’ll want to bring home in a bottle. 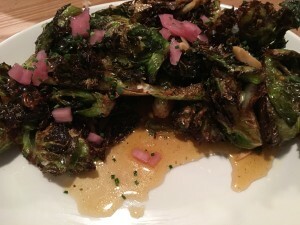 Mike Isabella- can this be your next venture? I’m perplexed by the dessert/coffee menu which states “All coffee selections are certified kosher.” Since the food isn’t kosher, I don’t think anyone eating here will care about whether the coffee is certified. Just saying. A warning… this isn’t the place for a quiet meal. The restaurant measures high on the noise scale. Even so, Bethesda is abuzz about the debut of Kapnos Kouzina, and that’s most definitely a welcome sound. yum! can’t wait to try it!! I’m sure you will enjoy it!